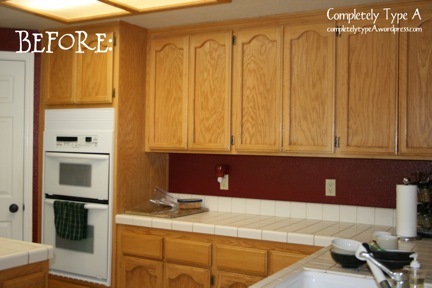 I used Rustoleum Cabinet Transformations, purchased at Lowes. You can watch their how-to video here. 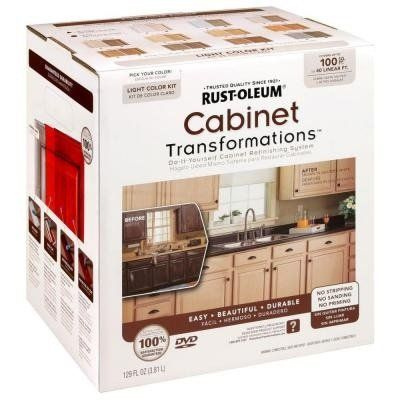 -Best paint there is at local Home Depot or Lowes for cabinet refinishing. -All supplies come in one box. There are two sizes: small for $75 or large for $150. We ended up buying one large and one small, total cost $225. Plus the hardware, another $150. -Great that everything comes in one box, until you run out of something. We had tons of lefts overs of everything except for paint. We bought the large box, but then had to buy a $75 complete small set for basically two quarts of paint. LAME. -The video makes it look like you can do it all in about 4-5 days. It took us two weeks. -We could not get the glaze right! More below on that. 3) glaze (optional)- couldn’t get it right. We tried multiple times to get the “glazed” look and it just looked dirty to me. We ended up painting over what we had glazed and left it just plain “quilters white”. 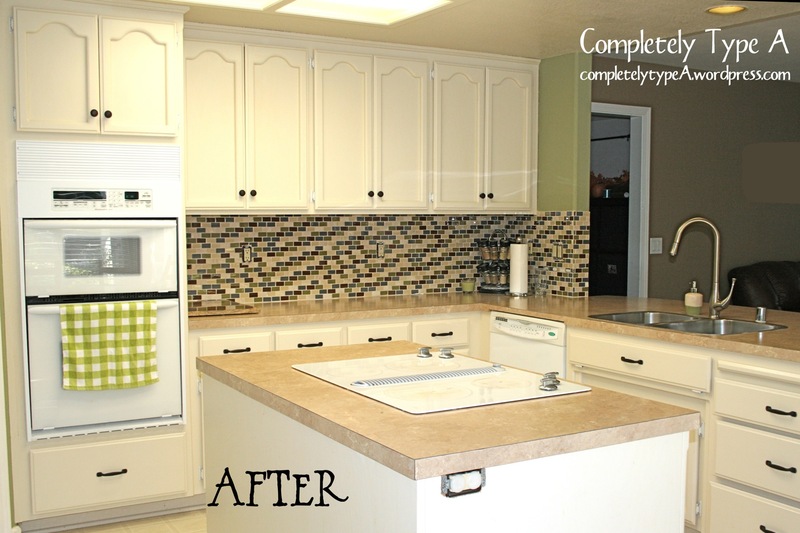 4) seal- easy, but actually isn’t clear, so changed the color of the cabinets slightly (for the worse- yellowish). -Have enough table space in your garage (don’t do it outside) for all your cabinet doors. We only had table space for half and the switching back and forth and drying on both sides of the doors took FOREVER. -The video shows letting the doors dry on nails on 2x4s (watch the video to see what I mean). Its worth doing this to minimize drips. -Double, triple check for drips everywhere. -Label each door with painters tape as suggested in video. Hummm… that’s all I can think of for now. Any questions? I am getting ready to try this in our kitchen as well. I really like how yours turned out. The only thing is I can’t decide is pure white or quilters white. I can’t really tell the difference online. Also, the one thing that worries me is the seal making it look yellowish. Is it really yellowy? Now that you have lived with it for a while do you think that it’s durable? i.e. any nicks and marks yet? Love your blog thanks for sharing. Hi Leslie, Thanks for checking out my blog. Honestly, I’m not sure I would go this route again. If it were just adults in my house, the cabinets would be fine, but with small kids, I’ve already got 3-4 good sized nicks. It cleans well with a wet rag, but I haven’t gotten out all the supplies again to do the touch ups for the nicks. I really like quilters white and the yellowish stain is bearable, just do a thin coat and catch ALL the drips. If I were to do it again, I would just get high gloss Swiss Coffee, the color of the rest of the trim in my house, and paint with that. I’m going to try this in the near future with some bathroom cabinets, so there will be a post about that method soon. Hope that helps. Good luck! Hi! I’m debating on the linen white or the quilters white… Is the quilters white very off white /cream or is it pretty subtle? Thank you! Its pretty subtle, it looks okay next to my Swiss Coffee colored trim. BUT the finishing glaze gives it a yellowish tint. Honestly, now that I’m five years in, I wouldn’t use Rustolem again. Its too hard to do touch ups! What color paint do you have on the island? Same as the rest of the kitchen, Quilters White Rustolem.